magazines | Kris Johnson's Blog…sort of. One of my co-workers has his subscription to Windows IT Pro magazine delivered to his work address, so every month or so I leaf through the magazine, ignoring all the articles and useful content and skipping right to the back page, which features “Ctrl-Alt-Del”, a collection of strange error messages and other IT-related humor that shows just how backwards and bizarre the field can be. It’s a very appropriate image but for one tiny detail. The three gears in the illustration, meshed as they so clearly are, will never turn. Two gears together would turn just fine, one clockwise and another counter-clockwise (or, if you prefer, anti-clockwise). A third gear would also turn just fine, provided it only meshed with one of the other two; but meshing with two gears turning (or trying to turn) in opposite directions creates a forever-frozen mechanism. Is this an unintended metaphor for the lack of real innovation in the Windows IT world? I’ll leave that for others to debate, but the irony is rather delicious. 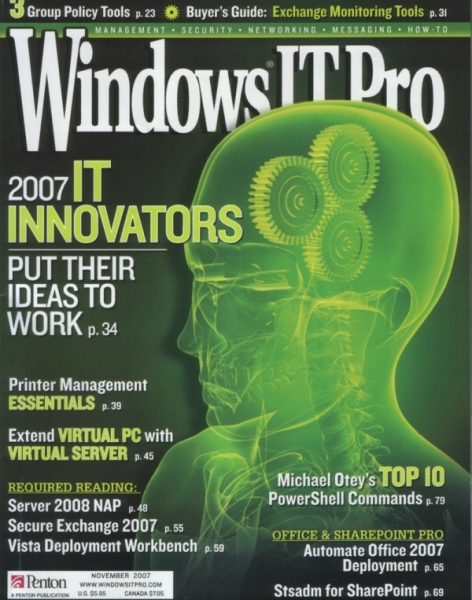 Perhaps the December 2007 issue of Windows IT Pro will feature their November 2007 cover in the “Ctrl-Alt-Del” column.